Synopsis: As a Washington psychiatrist unearths the origin of an alien epidemic, she also discovers her son might be the only way it can be stopped. It seems that it’s virtually impossible to make a bad movie out of Jack Finney’s serial The Body Snatchers. It first arrived on our screens back in 1956 with Don Siegel’s Invasion of the Body Snatchers, was then updated in 1978 with the action transplanted from a sleepy town to San Francisco. 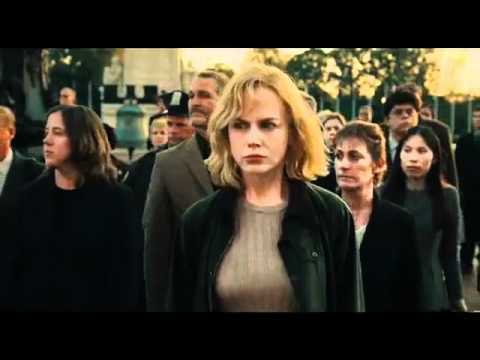 In 1993, Abel Ferrara moved the action once again, this time to a remote US military base, and finally (to date) in The Invasion, we have Nicole Kidman (The Paperboy) endeavouring to find her son in a Washington that is growing chillingly more ‘disconnected’ by the hour. All of these movies are terrific watches, and each adopts a different perspective from which to tell its tale, but it’s Siegel’s 1956 effort that remains the best of the lot for me. Oliver Hirschbiegel’s version more than holds its own in terms of white-knuckle tension, however, even though modern Hollywood sensibilities ultimately result in a damaging watering-down of the content in the final reel. Kidman is Carol Bennell, an estranged psychiatrist whose long-absent ex-husband Tucker Kaufman (Jeremy Northam — Carrington) has just started demanding access to their young son, Oliver (Jackson Bond) with whom he has previously barely made an effort to keep in touch. This would be troubling enough, it seems, but the situation is worsened by the fact that Tucker, a CDC investigator, is one of the first people to be contaminated by an alien life-form which has attached itself to a space shuttle which recently crash landed to earth. The infection works on its host during sleep, so that they awake with memories intact but no emotions or individual character. Tucker uses his position to fabricate a flu scare, the inoculation for which contains the alien spores, thus rapidly spreading the infection through the population via those who get themselves inoculated. The Invasion makes a point of distancing itself from outdated allegorical anti-communist sentiment by emphasising the lack of individuality of those infected by the alien spore and comparing their apparent passiveness with the human tendency to use , as a Russian diplomat suggests, ‘a veneer of civility to hide our true self-interests.’ In fact, the conversation between Carol Bennell and Russian Ambassador Yorich (Robin Rees — The Prestige) in which this comment is made pretty much encapsulates what the entire movie is about. And rather than Communist infiltration of the United States serving as the menace to society here, it’s the American foreign policy relating to places like Iraq. Political subtext is a passing interest, however, swiftly pushed aside so that the story can focus on a succession of taut, suspenseful encounters with the growing army of robotic infected. It’s a chilling scenario which is played to maximum effect for most of the movie, and while Carol and her son’s repeated escapes strain credibility to the limit, the pace with which The Invasion moves leaves the viewer with little time to notice while the story is unfolding. And, for once, the combining of science and action doesn’t feel forced. It’s just a shame that the ending, which sees normality return with indecent haste, feels so rushed and unconvincing, and Carol’s doubts about whether the world for which the humans fought is such a preferable one is referenced only by an aural flashback which may be perhaps a little too obscure to make an impression.